Fascinating Swarovski Crystal blog news featuring articles on new & retired Swarovski figurines & collectibles. Swarovski Jubilee Mo …. A “Mo”st Expensive Swarovski Mo! Our favorite crystal brand has the newest Swarovski Mo on the online shoppe: the Swarovski Jubilee Mo. Swarovski Jubilee Mo is clear, with a golden shadow coating. It features laser engraved floating chatons. Jubilee Mo is like the Swarovski Grandmother Mo of all the mo cows…. the Swarovski giant mo stands over 7″ tall! On the crystal brand’s web site, it indicates that Limited Edition Jubilee Mo will be available only in 2015. Congratulations to the Lovlots Mo character celebrating 10 mo-arvelous years! 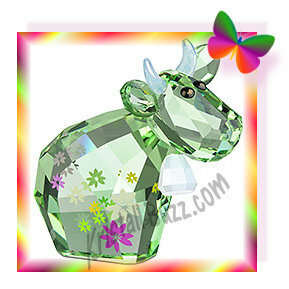 Swarovski Flower Power Mo, another Limited Edition Cow for Crystal Fanatics! Yesterday, we received notification from the crystal giant that the limited edition Swarovski Flower Power Mo would be available online in mid-May! The news on the official brand’s web site indicates that the Swarovski Flower Power Mo will be the final ‘Limited Online Edition’ in the herd of Mo Cows. While the news may sound sad at first, our contacts at the company indicated that there will be future releases of Mo Cows, it’s just that this will be the last one with exclusive online distribution. Swarovski uses some unique color names, so converting that into English, Flower Power Mo basically has a sky-blue body and an olive-green head. Lovlots Flower Power Mo is decorated with colorful pink, yellow, and violet daisy flowers on her body. Some of the last couple limited edition mos had maximum order quantities in the product description. Nothing of that nature was in the Swarovski announcement, so I don’t know if that will be the case with this one or not. Swarovski Lovlots Flower Power Mo will retail for $70 when she is officially available next month. Swarovski has produced nearly 20 Mo Cows in the Lovlots Mo herd, most of which are Limited Editions Mos. It will be interesting to follow the secondary market prices of the original Swarovski Flower Mo. For years, it has shown to be one of the highest dollar limited edition mos. This same trend is also true if you check out the online auction prices, where prices are presently in the $350 arena. So, mark your calendar for the lucky day of May 13! If you are looking for prior releases of the Lovlots Limited Edition Mo Cows, check out the Swarovski Limited Editions on the Crystal Exchange America website! Clients requesting the Lovlots Large Flower Mo or Lovlots Blue Flower Mo, generally indicate that they are certain of the Mo Cows existence as they have a friend that owns one, or that they have seen it elsewhere on the internet, like ebay (where sellers never? make mistakes). Check out this Large Blue Flower Mo auction that ended March 2012. What clients are referring to as the Large Flower Mo or Blue Flower Mo is actually Swarovski Belle Mo! But naturally, when you explain that you believe they are looking for Belle Mo, they will correct you saying it is the Large Flower Mo or Blue Flower Mo (and at that, it is time to give up and simply help them to decide if they wish to proceed with the purchase). To set the record straight….there is only ONE Swarovski Flower Mo, and it is a small light green cow with multi-colored flowers on it. Flower Mo is about 1.75” long and was a limited edition Swarovski cow available only in 2009. The larger cow mo with flowers is Swarovski Belle Mo. This cow is light blue in color, with blue flowers on it. Belle Mo is about 3.5” high and was available 2010 through 2012. The design of both of these Mo Cows is credited to Edith Mair. Swarovski Flower Mo one of the more expensive Mos to purchase, with an average selling range now at $290 – $350! Should the crystal brand ever release another Lovlots Mo Cow decorated with flowers, an update to this article will likely be required to prevent further Swarovski Flower Mo confusion. Swarovski Flower Mo (Limited Edition) and Swarovski Belle Mo can be found at Crystal Exchange America in the Lovlots and Zodiac store category. Hot! Hot! Hot! Dressed in her fiery costume, Hot Chili Mo will spice up your life. She sparkles in Fireopal crystal with a Citrine crystal head and ears, wearing a black elastic necklace with a hot chili pendant. This exclusive Limited Edition is engraved with the year of issue 2013. Not intended for children 15 and under. This Limited Edition Mo Cow will be out to pasture with all her 16 mo sisters, which began launching in 2006. The last four to launch in 2012 were: Swarovski Angel Mo, Swarovski Bubble Mo, Swarovski Lucky Mo, and Swarovski Magic Mo. As the official launch date of Hot Chili Mo was just a few days ago, Swarovski crystal fanatics should be able to place their order soon at the Swarovski shoppe or perhaps find one at their local Swarovski boutique! If you are interested to purchase retired Limited Edition Cows (originally part of the) Swarovski Lovlots collection, check out Crystal Exchange America in the Limited Edition Swarovski category. In June, our favorite crystal brand announced that the Swarovski Lovlots Angel Mo would be released July 9, 2012 joining a series of other Lovlots Mo cows. I find this interesting in that according to the Swarovski members’ only announcement which has since been removed from their website, Lovlots Angel Mo is a limited edition available only in 2012. I know the hype….I am a secondary market dealer that specializes in Swarovski. It means that some collectors will purchase a hoard of figurines, then sell them on Ebay at inflated prices or list them on our site at above retail price as the owner themselves wants to get in on the action of making some money. While it can be perceived as a win-win for me (the dealer) and the owner (the seller), it is certainly a losing situation for the buying collector who simply does not want to take a chance that it could be sold out prior to it being available here in the USA. Honestly, I don’t like how commercial Christmas has become….with artificial Christmas trees out mid-summer, decorations hitting stores after Labor Day, and so forth. All this before the Halloween trick or treating event or the Thanksgiving turkey is even cooked. While I can certainly appreciate the crystal giant putting on the brakes to ensure that Swarovski Christmas Ornaments and merchandise release dates are appropriate for the figurines, I think that delaying the Swarovski Christmas Angel Mo only for the USA collectors was an incredulous decision. Straight to the point, this is going to upset crystal fanatics in the USA. What could this mean to the crystal brand and its followers? Disappointed collectors. Collectors who ‘want it now’ will likely be forced to pay ‘above market prices’ to ensure they have the Lovlots Angel Mo in their crystal collection now. Reduced Lovlots Angel Mo profits. Dedicated Swarovski crystal collectors are not going to wait nearly 3 more months to get it online, instead, they will probably turn to the online auctions to buy it now and will not buy later from authorized source(s). Reliance on other distribution channels. Collectors will build bonds with new channels: secondary market brokers, gray market dealers, and eBay dealers. This is not about ‘fairness’…. it is about the loyal following of Swarovski crystal collectors and the reality of what goes on post-sale of limited edition Swarovski figurines. I really hope that when it comes to limited edition releases, that Swarovski will settle on a world-wide launch date to eliminate the mini-frenzy that could be bearing down upon the collectors in the USA. Swarovski News: Swarovski Magic Mo Appearing in 2012! Swarovski has announce to its SCS members that another Lovlots crystal cow is just weeks away from launching….Swarovski Magic Mo! Swarovski Magic Mo is dressed as a wizard for the Halloween holiday. This purple Lovlots cow is decorated with yellow stars and yellow moons. Magic Mo has her own special accessory…an orange jack-o-lantern. Magic Mo and her sidekick pumpkin are both wearing matching pointed black hats. Magic Mo is an online limited edition. The Swarovski sneak preview indicates that she will be available for purchase in late August of 2012′ but there is no mention of price. I am thinking that the price point will be higher than the swarovski bubble mo (which is $55) because of the added pumpkin. It seems a bit surprising the the crystal giant is releasing so many online limited edition Lovlots mo cows…apparently they must be big hits to do 2 or 3 each year. The first one in 2012 was the Swarovski Bubble Mo, which launched at the end of May. Then the Swarovski Angel Mo, which will launch in July. 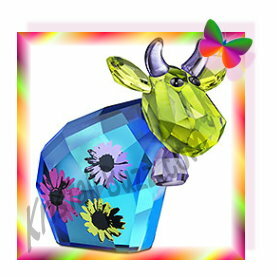 So give the Swarovski Lovlots Magic Mo a mystical, warm welcome to the Lovlots crystal cow herd! Swarovski collectors wanting to know more about the Swarovski Lovlots and other limited edition Lovlots can read more at the Crystal Exchange America web site! 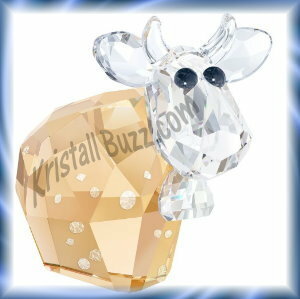 Our favorite crystal brand is blessing us with yet another Swarovski Lovlots cow….the Swarovski Angel Mo. The Lovlots Angel Mo cow is golden-colored, accented with bronze stars. Being Angel Mo, she naturally has shimmering wings too. This limited edition angelic cow will certainly remind Swarovski Santa Mo and the rest of the Swarovski Mo herd of the true meaning of Christmas. Swarovski did not share the MSRP of Angel Mo in its article for the SCS members. As the Lovlots mo cows have generally been around $55, I think this may be a reasonable estimate for the upcoming Christmas Lovlots addition. Since the Angel Mo crystal figurine is available online, collectors will not likely find it at a discount price. Buyers who want to save money should look for the email vouchers that the crystal brand sends out, and hope there are no exclusions for limited edition figurines. Swarovski crystal collectors will be able to purchase the Swarovski Angel Mo from the online shoppe in early July. This online limited edition crystal figurine will not be available in stores, so look for an email notice when she is officially available. Crystal Exchange America has a large selection of retired limited online edition Mos prior to the 2012 releases for collectors seeking those discontinued Mos. At their website, to find Swarovski Lovlots, navigate downward in the menu on the left side of the screen to the Lovlots and Zodiac category. Swarovski Bubble Mo is Here! A Magic Day for the Swarovski Mo Herd! May 29, 2012, our favorite crystal brand officially released the Swarovski Bubble Mo for purchase in their online shoppe. The Swarovski Mo herd is excited to welcome the new blue cow to the Lovlots family. The Mo Herd presently consists of…. On the crystal brand’s web site, they state that Limited Edition Swarovski Bubble Mo will be limited to 10 per person. This guideline is in place to ensure that many collectors can purchase them directly from Swarovski at original retail price of $65. If there were no maximum quantity in place (as has long been the practice on the Swarovski Mo figurines), they can be quickly found in the online auctions at higher prices, which does not make dedicated collectors very happy. Swarovski Bubble Mo blue cow is about 1 ¾” height. The company uses these colors in their official product description: Scuba Blue, Air Blue Opal, and Lavender crystal. Swarovski mentions that the laser engraved bubbles are symbolic of “bubbles of excitement” in the product description. Collectors wanting any of the retired or discontinued cow Swarovski Mo figurines can likely find them at Crystal Exchange America in the ‘Lovlots and Zodiac’ category of the store. I’m placing my order today for the Limited Edition Lovlots Bubble Mo. I hope she is as cute in person as she looks online! Swarovski Bubble Mo, 2012 Limited Edition, Blowing in May 29! Yesterday, I found an update on the crystal brand’s web site regarding the launch date of the upcoming Limited Edition Swarovski Bubble Mo. The company has announced to its SCS members that the 2012 Limited Edition Bubble Mo will be available for purchase in the online shoppe May 29. Swarovski Lovlots Bubble Mo is about 1 ¾” in height. The company uses these colors in their official product description: Scuba Blue, Air Blue Opal, and Lavender crystal. Swarovski mentions that the laser engraved bubbles are symbolic of “bubbles of joy” in the SCS news, and calls them “bubbles of excitement” in the product description. Swarovski states in their announcement, that the Swarovski Bubble Mo blue cow figurines will be limited to 10 per person. But don’t forget, there is only one Swarovski certificate per online order (modification in 2011), so if you desire a certificate for each Limited Edition Bubble Mo (which may not be a bad idea at all! ), collectors should purchase one Bubble Mo per order. Just remember, if you order one crystal figurine per order, additional shipping charges may be applied to the order. The Swarovski Lovlots Bubble Mo (blue cow) and Swarovski Lovlots Lucky Mo (green cow) are both Limited Editions that are only available in 2012, hence retiring at the end of the year if not sold out prior to that date. There are about 15 Swarovski Lovlots figurines that are retiring in 2012. Other Lovlots may be slated for retirement later in the year, but those figurines (if any) have not yet been announced. These Swarovski Lovlots Retirements can be found at www.RetiredSwarovski.com in the Swarovski Lovlots product line (down the left side of the browser window). Swarovski Bubble Mo – the Lovlots New Blue Cow! 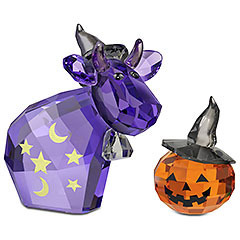 Yesterday, I came across this Swarovski blue cow (by accident I must say) on the crystal brand’s web site: Swarovski Bubble Mo! This discovery was quite the surprise! According to the product description, Swarovski Bubble Mo will be an online exclusive that will retail for $65 USD. The blue bubble decorations are laser engraved into the crystal, not tiny decals like some of the other decorations on the limited edition mo figurines. While the Lovlots Bubble Mo will be available only in 2012, I did not see any information on the launch date. The crystal brand produced one other blue cow: Swarovski Belle Mo. This Lovlots blue cow officially retires in 2012, but it does appear that it is no longer available in Swarovski’s online shoppe. So let’s give a this Lovlots blue cow, Swarovski Bubble Mo, a warm welcome to the “Lovlots Mo herd”! Crystal Exchange America has more details about Swarovski Lovlots Mos special editions. If you are looking specifically for the Swarovski Limited Edition Mo figurines, they can be found in the Limited Edition Swarovski category of this online store. I’m starting to see the 2012 Swarovski releases on the web. There are a number pictures appearing at authorized retailer websites in North America and in Europe, so the release must be just around the corner. 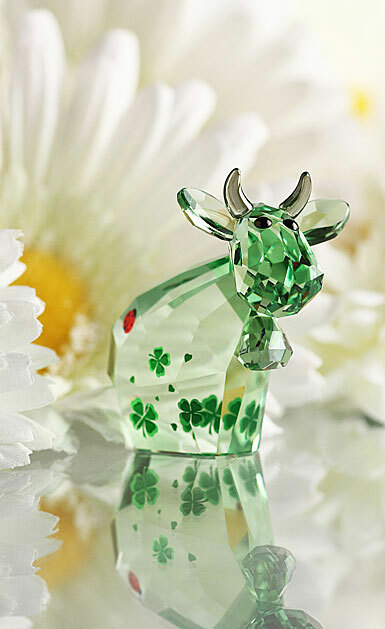 The Swarovski Lucky Mo (green cow) looks like a fun crystal figurine. Lovlots Lucky Mo is a light green ‘Mo figurine’ decorated with 2-color 4 leaf clovers, green hearts, and a tiny red ladybug on the hind end! Descriptions indicate that this is a Swarovski Lovlots limited edition available in 2012, much like Swarovski Sunshine Mo or Swarovski Santa Mo are/were available in 2011. The height of Lucky Mo is 1.75” and retail price is $65. The Swarovski identification # for Lucky Mo is 1096750. I’m wondering if it is the same light green shade as Swarovski Flower Mo, or if there is a different variation of green. Swarovski Flower Mo is decorated with flowers vs the lucky clovers on the newest cow mo. The crystal giant has produced a number of other (mostly limited edition) Swarovski Mo figurines, dating back to 2006. One of the Swarovski stores taking pre-orders is “Crystal Classics” in Columbus, Ohio, but there are a number of them on the internet. The Swarovski Lucky Mo green cow appears to be a real cutie. It would make a great gift for St Patricks Day or even a cute 4-H award. So you go girl….Lucky Mo, go join your Swarovski crystal sisters in the Lovlots pastures! Just a few days ago, I wrote about the impending release of the Swarovski Santa Mo figurine. I found out today that the official launch date of this ‘ho ho ho’ Christmas Mo is July 11, 2011 in the online Swarovski shoppe. The article on the Swarovski site did not mention when it would be available at the official Swarovski retailers or Swarovski boutiques. This adorable Swarovski Lovlots limited edition cow (Swarovski system number 1096024) has a light siam (red) body and hat. It is accented with white alabaster balls on the hat and down the front of the cow’s Santa suit. Santa Mo’s face, ears and horn are in clear crystal. This Swarovski figurine will be available only in 2011 ‘while stocks last’. The Swarovski article does not mention price, however, it is believed that it will retail near $65 – $70 per crystal figurine, which is a similar range to other limited edition Mo figurines. When the Lovlots cow Santa Mo is sold out or retired by Swarovski, crystal collectors will have to acquire the limited edition crystal cow from online auctions or the secondary market. Crystal Exchange America will advertise any listings for the Swarovski Santa Mo figurine in the ‘Lovlots and Zodiacs’ category of the online store: www.CrystalExchange.com . That being said, it will likely be will be least expensive for any Swarovski collector to secure this figurine while it can be purchased as a current product. It has been rumored for some time now that a Swarovski Santa Mo, a new Lovlots figurine would be released this year. Over the weekend, I have found web site product pages at three different authorized retailers. This Swarovski Lovlots cow has a light siam (red) body and hat. It will be decorated with white alabaster balls on the hat and down the front of the Santa suit. Santa Mo’s face, ears and horn are in clear crystal. The Swarovski system number is 1096024. The consensus is that the Lovlots Santa Mo should be available for purchase in July / August 2011. The marketing on this item is different than Swarovski Sunshine Mo. Sunshine Mo is an online limited edition and available only at the Swarovski web site, not from authorized retailers. The Swarovski Santa Mo will be available at authorized retailers in addition to being available for purchase at the online shoppe. It appears that the retail price of the Lovlots Santa Mo will be similar to Sunshine Mo, perhaps $65 – $70 per crystal figurine. Once the Lovlots figurine is retired by Swarovski, crystal collectors will turn to online auctions or the secondary market to purchase the crystal cow. As soon as Crystal Exchange America, web site located at www.CrystalExchange.com, has any listings for the figurine, the Swarovski Santa Mo will be found in the ‘Limited Edition Swarovski’ category of the store. That being said, it will be least expensive for any collector to secure their figurine while it can be purchased as a current product, not once it has officially been discontinued. Swarovski Sunshine Mo, Limited Edition Lovlots Cow, Officially Launched! The Swarovski Sunshine Mo is now available for purchase at the Swarovski web site. This Limited Edition Lovlots Cow retails for $65. Sunshine Mo is another one of those Swarovski Limited Editions that ‘is available ‘while supplies last’….no total production quantity mentioned and only a cutoff order date of 2011. The Sunshine Mo crystal cow looks delightful. According to Swarovski’s description, she is vibrant jonquil figurine with peridot crystal horns and light smoked topaz crystal ears wearing beautiful necklace in a stunning gradation of tropical crystal colors. The Swarovski Mo family is expanding and starting to become a small Swarovski LE herd. I can just imagine all the Swarovski Mo figurine family planning a little party inside my crystal cabinet…some nice party music, frozen daiquiris, all having a good time. Pinky Mo (Swarovski LE 2007), Alabaster Mo (Swarovski LE 2007), Soccer Mo (Swarovski LE 2008), Flower Mo (Swarovski LE 2009), Halloween Mo (Swarovski LE 2009), Country Mos (Swarovski LE 2010, Glamour Mos (Swarovski LE 2010), and Charming Mo (Swarovski LE 2011) will all be in attendance. 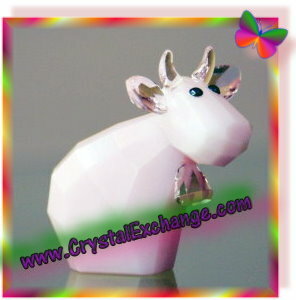 Crystal Exchange America has listings for many of the Swarovski Mo Cows and Swarovski Lovlots special editions. Just visit http://www.crystalexchange.com/ and navigate to the Limited Edition Swarovski category in the menu on the left side of the web site. 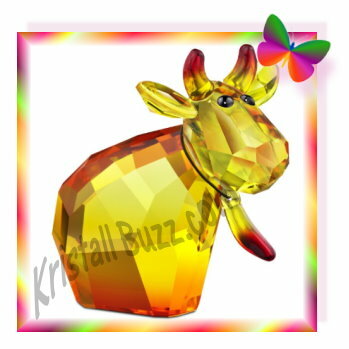 Swarovski Lovlots Sunshine Mo, Limited Edition Crystal Cow, ‘Moove’ Date is May 30! Today, crystal fanatics all around the world (myself included) received an email from Swarovski announcing that the Swarovski Sunshine Mo will be available for purchase (in 23 countries) beginning May 30, 2011! According to the Swarovski web site, they say that this online limited edition is going to be a rare Swarovski figurine. This then begs the question….does that mean that Swarovski is producing and releasing a much smaller quantity of Sunshine Mo figurines than her predecessors, sisters, and cousins on the Swarovski Lovlots West End? 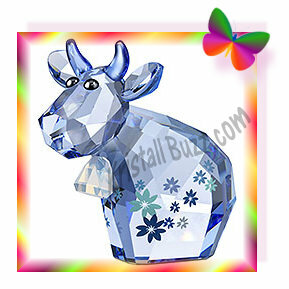 Crystal Exchange America has listings for many of the Swarovski Mo Cows and Swarovski Lovlots special editions. Just visit http://www.crystalexchange.com/ and navigate to the ‘Lovlots and Zodiac’ category in the menu on the left side of the web site. ©2017 Crystal Exchange America. Kristall Buzz is a Swarovski Crystal Blog maintained by the Swarovski experts at Crystal Exchange America. This crystal buzz blog for Swarovski crystal fanatics is not endorsed, sponsored or licensed by, or otherwise affiliated with Swarovski AG. The Kristall Buzz Swarovski blog has in no way been approved by Swarovski AG.